Joseph Brant was the son of Francis Xavier J. Brant and Margaret Tacke. Carl Brant was the son of Francis Xavier J. Brant and Margaret Tacke. Aloysius Brant was the son of Francis Xavier J. Brant and Margaret Tacke. Viola Brant was the daughter of Francis Xavier J. Brant and Margaret Tacke. Delores Brant was the daughter of Francis Xavier J. Brant and Margaret Tacke. Leonard Weigman married Leona Brant, daughter of Joseph Brandt and Dora Haas. Leonard Weigman was born circa 1894 at Wisconsin. Joseph F. Schueller was born circa 1893 at Iowa. 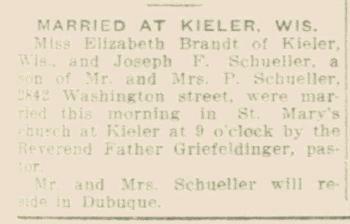 He married Elizabeth Brant, daughter of Joseph Brandt and Dora Haas, in September 1923 at Kieler, Grant, Wisconsin, Elizabeth Brandt and Joseph F Schueller marriage announcement. Joseph Simon married Christina Brant, daughter of Joseph Brandt and Dora Haas. Joseph Simon was born on 23 December 1883 at Grant, Wisconsin. He died in 1939 at Grant, Wisconsin. Charles C. Bauer married Gertrude Brandt, daughter of Joseph Brandt and Dora Haas. Charles C. Bauer was born circa 1893 at Illinois. Frank Goodell married Furi Robinson, daughter of Joseph Robinson and Lydia (?). Name Variation Elmer Attenburg was also known as Attenberg. Donald Dean married Irma Anna Burbach, daughter of Joseph J. Burbach and Christina E. Lambert. Charles Schulz married Verna Mae Allen after 1917. Mary Schulz was born after 1917. She was the daughter of Charles Schulz and Verna Mae Allen. Married Name Her married name was Saxland. (?) Schulz married Leonard Saxland. (?) Schulz was born after 1917. Leonard Saxland married (?) Schulz, daughter of Charles Schulz and Verna Mae Allen. Name Variation James E. Braden was also known as Jim. Gail E. Thompson was born on 6 November 1942. He married Loretta Elaine Braden, daughter of Lon Franklin Chadwick and Leta Irene Hibdon, on 7 December 1989. Gail E. Thompson died on 23 February 2005 at age 62. (?) Sutton married Loretta Elaine Braden, daughter of Lon Franklin Chadwick and Leta Irene Hibdon, before 1954. Name Variation Louis Hoffman was also known as Lewis. Louis Hoffman married Alice Hamilton, daughter of James E. Hamilton and Sarah Wealthy Israel. Louis Hoffman was born in 1881. He was buried in 1941 at Mount Pleasant Cemetery, Cuba City, Grant, Wisconsin. Clarence Eastlick married Fanny Israel, daughter of George Washington Israel and Elizabeth Chapman. (?) Eastlick married Nora Israel, daughter of George Washington Israel and Elizabeth Chapman. Married Name Her married name was Seitz. Maryann Garrett was the daughter of William L. Garrett and Margaret S. Kreiser. Maryann Garrett married Clarence Seitz. Clarence Seitz married Maryann Garrett, daughter of William L. Garrett and Margaret S. Kreiser. Roger Udelhoven was the son of Anthony Udelhoven and Marie A. Pitzen. Paul Udelhoven was the son of Anthony Udelhoven and Marie A. Pitzen. Keith Udelhoven was the son of Anthony Udelhoven and Marie A. Pitzen. Married Name Her married name was Ehlen. Joan Udelhoven was the daughter of Anthony Udelhoven and Marie A. Pitzen.